The ‘Hokey Pokey Men’ of Glasgow. Carlo Gatti is credited for introducing ice cream to the British as a street food. Throughout the 1850s, he peddled his sweet treats from his brightly painted cart. He and a few other ice cream vendors found such a ready market that they began bringing other Italians over to join them in the venture. As the economy in Italy took a nosedive, the trickle of Italian emigrants rapidly became a flood. Some went to America, though a large number made their home in Scotland. The established community of Italians began to bring friends and relatives in to work in the family industry. Padrones, or “benefactors”, would send agents back to Italy to recruit cheap labour for their enterprises – primarily the ice cream business. Carlo Giuliani was one of the most successful and well-known of the padrones, and he is credited with laying the foundation for the ice cream industry in Scotland. Many Italian immigrants arrived with little to nothing, and initially made a living by begging or as itinerant musicians playing the hurdy-gurdies on street corners. The hurdy-gurdy men and the beggars realized that they could make more money selling ice cream, and the padrones were all too eager to give them a barrow and take a cut of the profits. 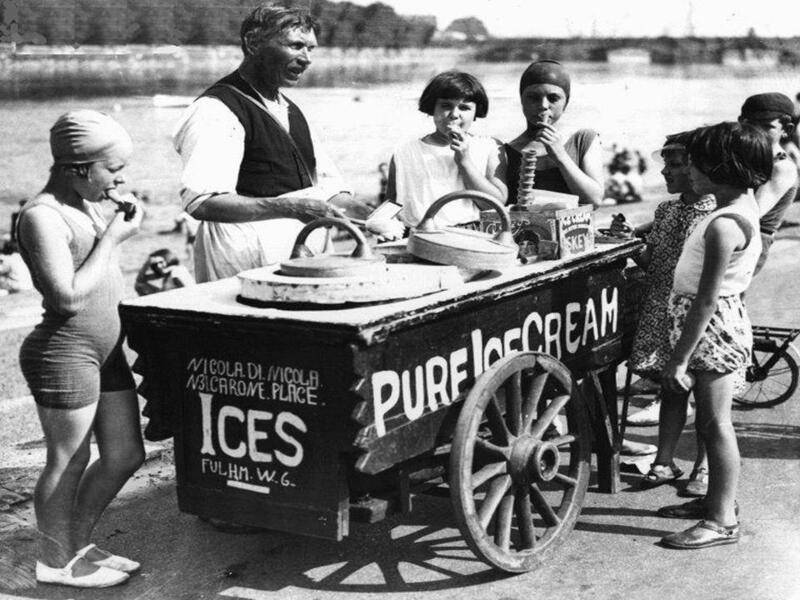 Every morning throughout the warm summer months, the Italians would work their hand-cranks to freeze the ice cream mix they had prepared the night before, and then they would set off on their rounds. “Gelati, ecco un poco!” This cry quickly earned them the nickname “hokey pokey men”. While they were making more money, the immigrants were still grossly underpaid and lodged in poor conditions. 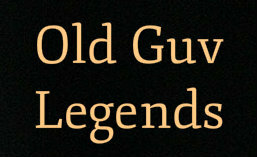 During the winter months, many had to go back to working as hurdy-gurdy men to earn enough to survive. The Italians spoke little English at first, and many were subjected to mischief and abuse at the hands of local youth. Necessity forced the immigrants to persevere, however, and many soon became very successful. 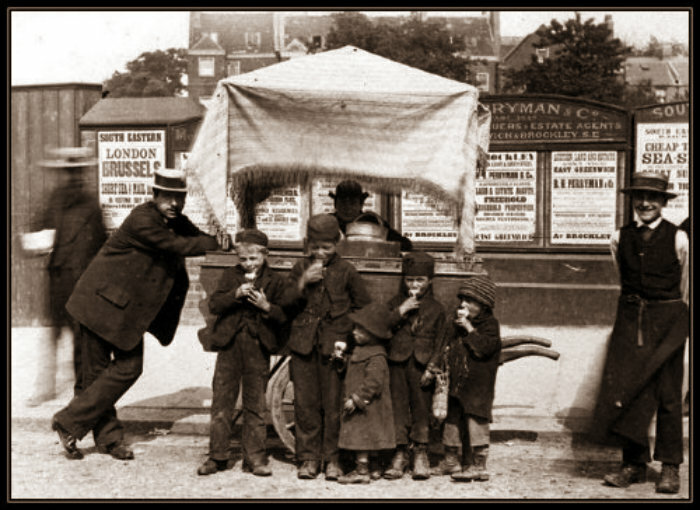 In a short 50 years between 1870 and 1920, the ice cream vendors had graduated from rickety hand carts and shabby slum shops to rather luxurious establishments. Ice cream cafes along Sauchiehall Street and in Glasgow’s city centre boasted leather-covered seats, glossy wooden booths and mirror-lined walls. Carlo Giuliani himself was running three hugely successful cafes in Glasgow by 1890, and customers were pouring in by the thousands. He often had five or more assistants working behind the bar serving out ice cream and drinks like ginger ale. This entry was posted in ART AND CULTURE and tagged nostalgia. Bookmark the permalink. ← Hoefnagel’s Guide to Constructing Letters, c. 1595.